Counter terrorism takes a comedic turn in the movie Army of One, starring Nicholas Cage as a misguided soul who believes himself on a mission to rid the world of Osama Bin Laden. While the US Troops received their command to capture the al-Qaeda leader from their commander-in-chief, unemployed handyman Gary Faulkner (Cage) got his orders from a series of visions of no less than “God” Himself. Following God’s (Russell Brand) instructions, Faulkner makes his way to Pakistan and meets all sorts of characters as colorful and crazy as he is. What’s even crazier is that the movie is actually based on a true-to-life story, with a real Gary Faulkner who was able to infiltrate the backwoods of Pakistan, literally where no journalist or US soldier had successfully ventured out on his own. The real McCoy was eventually arrested in Pakistan, but only after the former construction worker had an encounter with a “bearded man in a white robe speaking on a walkie-talkie” on an 18,000-foot mountain along the border of Pakistan and Afghanistan. Time Magazine published a story on Faulkner and his plot in 2010, where he wandered into enemy territory with a “pair of plastic handcuffs”. The story is rich fodder for a movie plot, of course, and caught the attention of director Larry Charles whose controversial lampoons include Bruno, Borat, and The Dictator. The film is co-written by Rajiv Joseph, Pulitzer Prize finalist for his play “Bengal Tiger at the Baghdad Zoo,” and co-stars Wendi McLendon-Covey (“Bridesmaids”), Rainn Wilson (“The Office”), Ken Marino (“Party Down”), Denis O’Hare (“True Blood”) and Paul Scheer (“The League”). 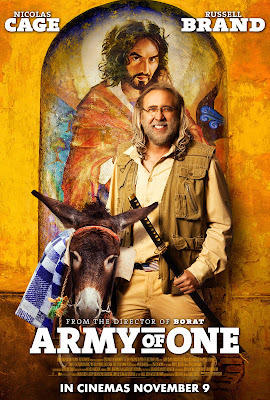 Army of One is set to screen in Philippine cinemas on November 9, 2016. The comedy is released locally by Octotarts Films International. Gary Faulkner (Nicolas Cage) is an ex-con, unemployed handyman, and modern day Don Quixote who receives a vision from God (Russell Brand) telling him to capture Osama Bin Laden. Armed with only a single sword purchased from a home-shopping network, Gary travels to Pakistan to complete his mission. While on his quest, Gary encounters old friends back home in Colorado, the new friends he makes in Pakistan, the enemies he makes at the CIA – and even God and Osama themselves.